Mom has never been one to look a gift pony in the mouth - especially when they are treats this sweet. She has received some special tokens in the last couple of weeks that truly show thoughtfulness and were worth sharing. 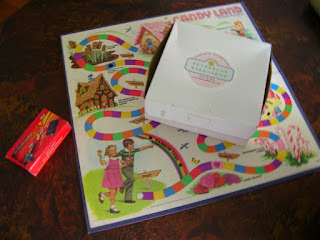 Just Jill was cleaning out her attic and gave her a vintage Candy's Land game board, circa seventies. Lil' Miss Bibb didn't leave her summer affairs with NYC without a box of Buttercup cupcakes for her friends. And Mom's pop? Well, he gave her that stun-gun you see here in the red box. Nothing says love like good friends, sweet thoughts and a daddy who still makes sure his daughter is armed and dangerous.